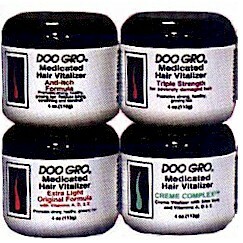 Doo Gro® Medicated Hair Vitalizer helps stimulate blood flow to the scalp to help promote strong, healthy, growing hair. This unique Extra Light Original Formula with Vitamins A, D, & E strengthens and revitalizes tired and breaking hair. Safe to use on all types of hair, including children's.